representative of the City of Hope. Hope for their dedication and hard work this past year. 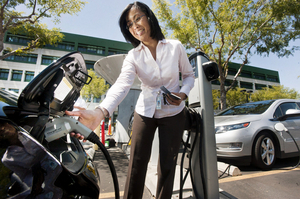 Finding a place for electric vehicle owners to plug in is both a challenge and an opportunity, experts said at Tuesday’s seminar at the AQMD in Diamond Bar. Electric car sales have been rising, with the all-electric plug-in Nissan Leaf on track to be responsible for about 12,000 vehicles on the road nationwide by the end of this year, and about 30,000 Chevy Volts – an electric plug-in with a gasoline engine – being sold in the U.S., according to industry estimates. The slow but steadily increasing sales of these electric cars, plus newer ones such as the Honda Fit plug-in, Coda’s plug-in sedan, Mitsubishi’s iMiev and the limited number of BMW’s Active E, mean that there will be more drivers looking to plug in rather than fill-up. Cities and employers must be ready for the challenge, a gauntlet laid down by Gov. Jerry Brown in March when he signed an executive order asking local governments to accommodate 1.5 million plug-in electric cars in California by 2025. An electric car industry trade group, called the Plug-In Electric Vehicle Collaborative, hosted Tuesday’s seminar to spread the governor’s message: Be prepared. Read more in Steve Scauzillo’s story PLUG. The Puente Hills Concerts in the Park return tonight at Schabarum Regional Park in Rowland Heights. Bring your friends and family to the free summer concerts every Tuesday from 7 to 9 p.m.
Tonight’s show is the class rock group The Answer. The popular programs are supported by the Los Angeles County Parks and Recreation Department as well as Los Angeles County Supervisor Don Knabe. Laurie Covarrubias is a trailblazer, at least in her family. 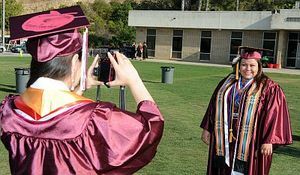 The 29-year-old Native American resident of West Covina graduated Friday from Mt. San Antonio College in Walnut with an associate’s degree in social and behavioral sciences. She’s done a lot in the past few years, but attending college was a feat unequalled by both her parents and grandparents. Covarrubias was one of more than 2,300 students to graduate from Mt. SAC this year. The school is the largest single-district community college in the state, serving some 60,000 students. Read more in Hilary Smith’s story LAURIE. They must really love basketball. 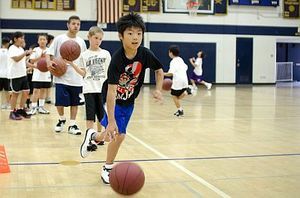 On the first day of summer vacation, Rowland youngsters returned to school for the summer basketball camp. No sleeping in for the young hoopsters, starting at 8:30 a.m. in the Rowland High gym. The sleepy-eyed youngsters lined up for head basketball coach Gordon Hamlow and assistant varsity coach Jason Villanueva. The kids bounded back and forth across the floor as they warmed up. The happy campers ranged in age from 5 to 14 years old. Read more in Rich Irwin’s story BASKETBALL. The Rowland Water District board Tuesday unanimously approved a plan to advance a new pipeline that will move locally purchased water to its customers for the first time in its history. The district will now begin designing the pipeline. The city of La Habra Heights will have to approve the project. The district could go out to bid in the fall and the pipeline could be completed by the end of the year. It is expected to cost about $750,000. Rowland Water, which serves about 58,000 people in Hacienda Heights, Rowland Heights and portions of La Puente, Industry and West Covina bought water rights from the Central and Main basins. It signed agreements to move the water through systems owned by the La Habra Heights County Water District and Orchard Dale Water District and the new pipeline. They’re back! Yes, the Puente Hills Concerts in the Park return Tuesday, June 19, at Schabarum Regional Park in Rowland Heights. Bring your friends and family to the free summer concerts every Tuesday from 7 to 9 p.m. They continue through July 31. The popular programs are supported by the Los Angeles County Parks and Recreation Department as well as Los Angeles County Supervisor Don Knabe. June 19 — The Answer playing classic rock. June 26 — The Diamonds performing rock ‘n’ roll. July 3 — Sounds of Cypress Orchestra offering musical theater, TV and movie scores and light classical. July 10 — Mariachi Divas, a Grammy Award-winning all-female mariachi band. July 17 — Rod Piazza, a garage/surf band. July 24 — Hot August Night, a tribute to Neil Diamond. July 31 — Cold Duck, a premiere dance band. Concerts In The Park is a great way to spend your Tuesday evenings with some of the most entertaining musical acts around. On Tuesday, the Rowland Water District board will vote whether to reduce that distance by 596.5 miles. In the mind of this small, East San Gabriel Valley water district, the shorter the distance, the less chance anything can go wrong to jeopardize the precious water supply. In the jargon of Southern California water managers, who operate in a semi-arid region under the threat of earthquakes and brown-outs, it’s called enhancing water reliability. For Ken Deck, whose main job is to supply water uninterrupted to 13,500 connections, a second source of water means being able to sleep better at night. A Chinese national arrested while trying to board a plane to China after skipping his court date for an alleged beating and robbery of another man in Rowland Heights appeared in court Thursday, officials said. Gangyi Zhang, 20, pleaded not to charges of robbery and assault with means likely to cause great bodily injury in West Covina Superior Court, Los Angeles County District Attorney’s Office spokeswoman Shiara Davila-Morales said. Zhang is accused of taking part in the beating and robbery of a man March 30 at a restaurant in the 18700 block of Colima Road in Rowland Heights, according to Deputy Benjamin Grubb Grubb of the Los Angeles County Sheriff’s Homicide Bureau. Read more in Brian Day’s story ZHANG. Coroner’s officials on Monday identified the 13-year-old Santa Monica boy killed by a suspected drunken driver over the weekend. The California Highway Patrol initially identified the child killed as a girl in its original press release. An autopsy for Maximillion Infinity Petrakos is scheduled for today, according to Lt. Fred Corral of the Los Angeles County Department of the Coroner. Petrakos’ mother and 10-year-old brother also were injured in the crash, which happened 12:40 a.m. Sunday on the right shoulder of the 60 Freeway, just east of Seventh Avenue. The 13-year-old boy and his mother were standing outside their disabled Toyota Corolla when a Honda Civic heading west on the freeway drifted toward the right shoulder and struck them and the Corolla. CHP Officer Al Perez said Monday that the mother was in critical condition at a hospital. Her 10-year-old son, who was sitting in the back of the car, suffered moderate injuries.